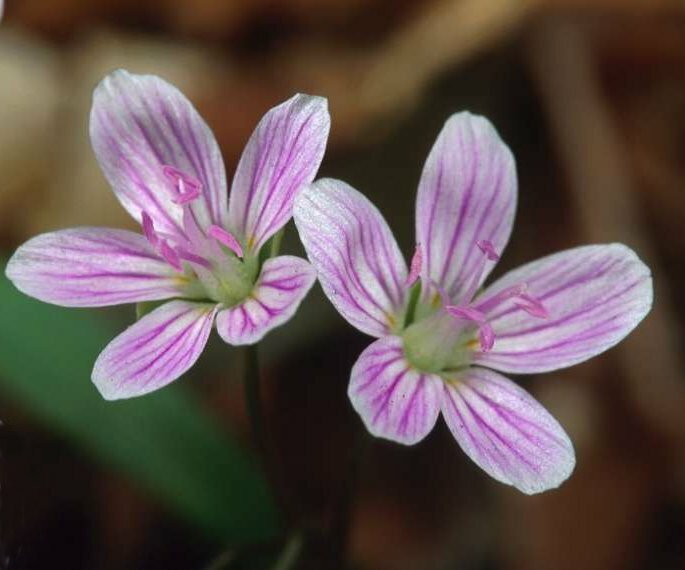 Some wildflowers, like hepatica, anemone, and trillium, wear fancy Greek or Latin names. Others, like cohosh and poke, bear colorful American Indian labels. However, often the prettiest and most appropriate names are simple American English. Such is Spring-beauty, whose name tells its story. In early spring groves of these small, pink flowers welcome the winter-weary, who head for the woods in search of the season of new life. The flowers seem so delicate – and in a sense, are, since they will quickly wilt if picked. Yet they are able to withstand freezing nights and raw days. The Indians’ interest in Spring-beauty was more practical than esthetic. They knew that down below, the plant’s little round corm offered food, sweet and a bit nutlike, and wearing a skin like a potato. Indeed, they have been called wild potatoes. But an even better name, so typical of wonderful old English-language folk names for wildflowers, is fairy-spuds.